$50 ea when you buy 4 or more. Saw Shells are often considered the hardiest of the turtles. 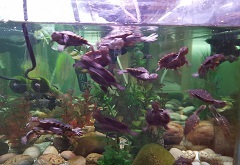 These turtles are all feeding well and in great health. They are just a bit bigger than the size of a 50c piece.